At first glance this NASA/ESA Hubble Space Telescope image seems to show an array of different cosmic objects, but the speckling of stars shown here actually forms a single body — a nearby dwarf galaxy known as Leo A. Its few million stars are so sparsely distributed that some distant background galaxies are visible through it. 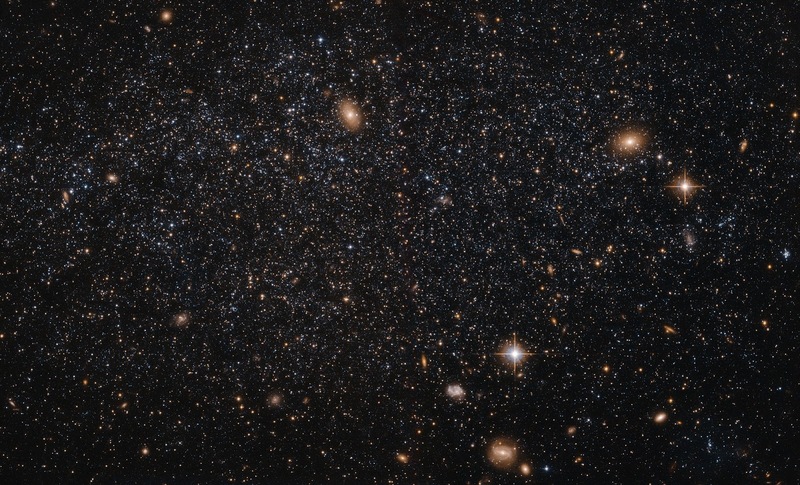 Leo A itself is at a distance of about 2.5 million light-years from Earth and a member of the Local Group of galaxies; a group that includes the Milky Way and the well-known Andromeda galaxy. Astronomers study dwarf galaxies because they are very numerous and are simpler in structure than their giant cousins. However, their small size makes them difficult to study at great distances. As a result, the dwarf galaxies of the Local Group are of particular interest, as they are close enough to study in detail. As it turns out, Leo A is a rather unusual galaxy. It is one of the most isolated galaxies in the Local Group, has no obvious structural features beyond being a roughly spherical mass of stars, and shows no evidence for recent interactions with any of its few neighbours. However, the galaxy’s contents are overwhelmingly dominated by relatively young stars, something that would normally be the result of a recent interaction with another galaxy. Around 90% of the stars in Leo A are less than eight billion years old — young in cosmic terms! This raises a number of intriguing questions about why star formation in Leo A did not take place on the “usual” timescale, but instead waited until it was good and ready.